My skin is sensitive and im prone to pimples and I have oily face too. That's why i used to wash my face thrice or four times a day. How can i prevent or get rid of acne scar? I would recommend Mischka Derma Secret Pore Minimizer Set for Sensitive Skin, Oily, and Acne Prone Skin for only P600. Gentle formula that exfoliates,fights blemishes, shrinks pores and erases irritation in one step. Kills bacteria at its root, excess oil on face is reduced, prevents pimples from coming back. Blended with botanical extract that refuces irritation and redness as it conditions skin to alleviate tightness, stinging and sensitivity. 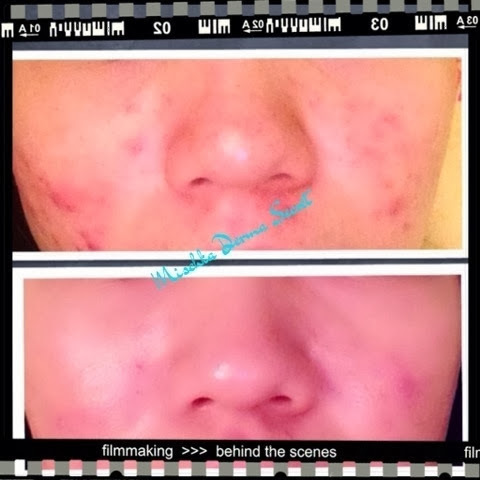 Before and After Picture of her happy and satisfied client. Real results, Effective and Safe. Although I seldom have breakouts, it never came to this (except when I was still in my teens due to hormones) ... the only problem is the darkening when one or two decides to breakout. Would definitely want to win this for me to try it and recommend it to my sister as well. Hi Winnie, I would definitely recommend it!